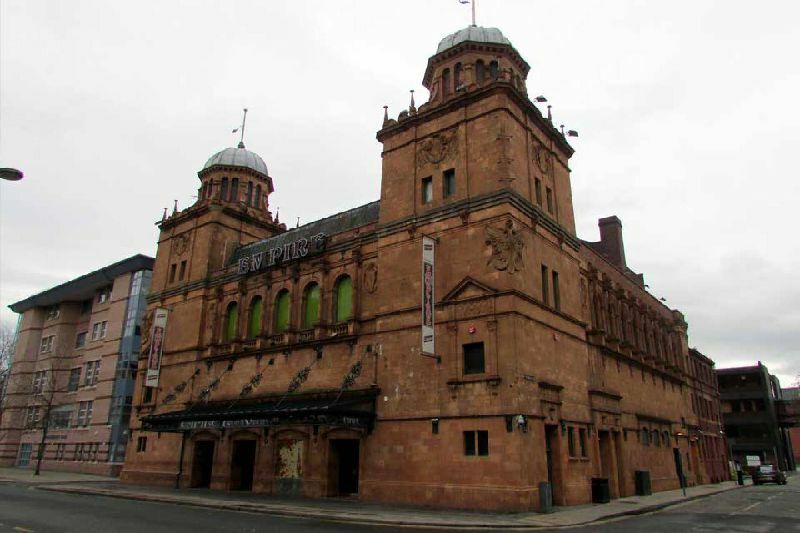 Built in 1897 as a music hall The Middlesbrough Empire has played host to a variety of performers including Charlie Chaplin, Laurel & Hardy, The Scissor Sisters, The Arctic Monkeys and Kasabian! 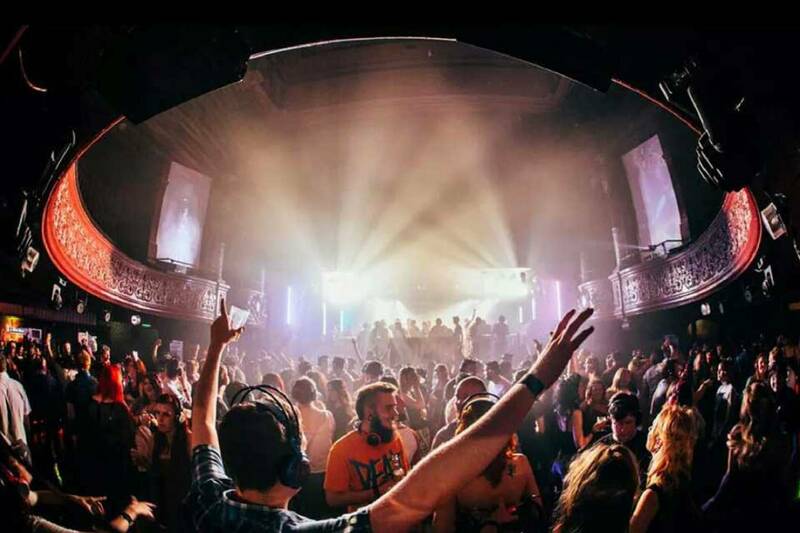 Since he bought the venue 1991 Barry Faulkner has transformed the derelict building into one of the countries finest venues/nightclubs. 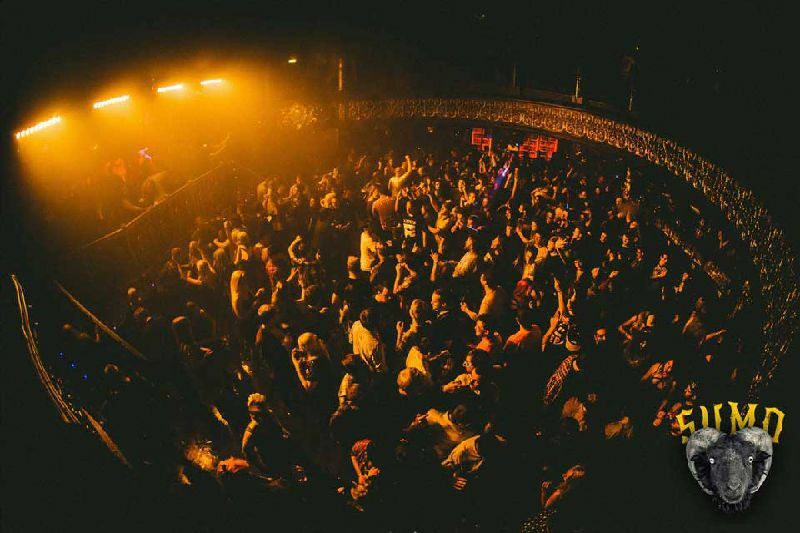 The Empire retains all it's former glory with 3 floors dedicated to style and music. We now take Apple Pay and contactless payments. at the same time in our new phone lockers. 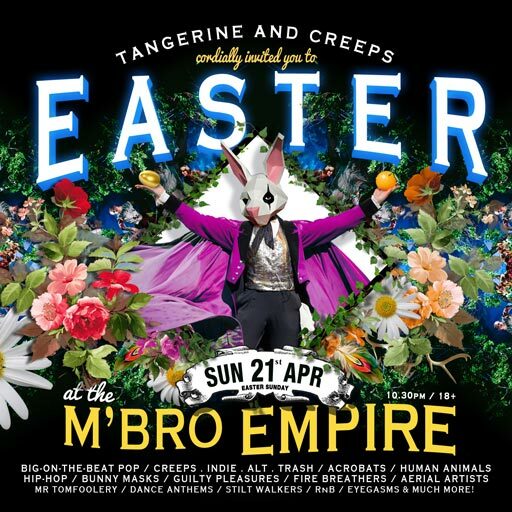 One 'eggstraordinary' night of music, magic and magnificent tomfoolery featuring the north east's finest djs and a huge cast of performers over 4 rooms of the grand-splendid Empire. Expect big-on-the-beat pop, Creeps indie-alt-trash, flying acrobats, human animals, hip hop, 100s of exclusive bunny masks, guilty pleasures, fire breathers, still walkers, woodland creatures, r-n-b, Mr Tomfoolery, dance anthems, bunny girls & boys, sugar rushes, disco, eyegasms and 1000+ beautiful souls! 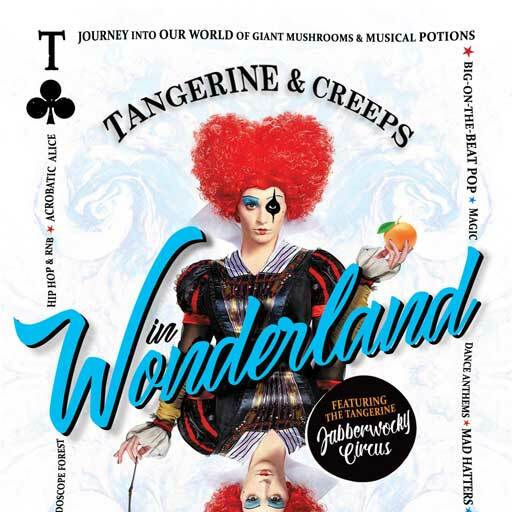 Tangerine in Wonderland. 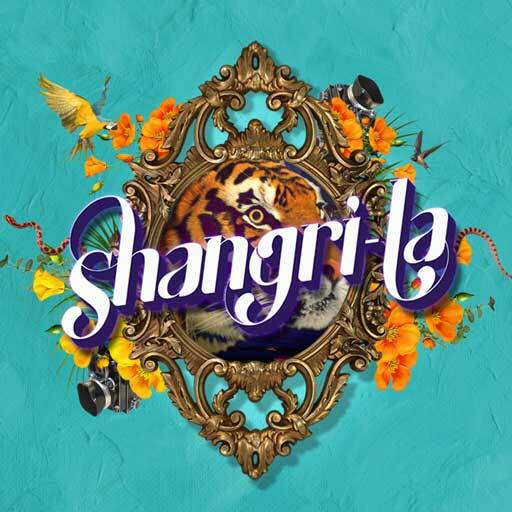 Expect big-on-the-beat pop, Creeps indie-alt-trash, flying acrobats, human animals, hip hop, guilty pleasures, fire breathers, still walkers, woodland creatures, r-n-b, Mr Tomfoolery, dance anthems, sugar rushes, disco, eyegasms and 1000+ beautiful souls! Featuring the extraordinary Enchanted Circus. 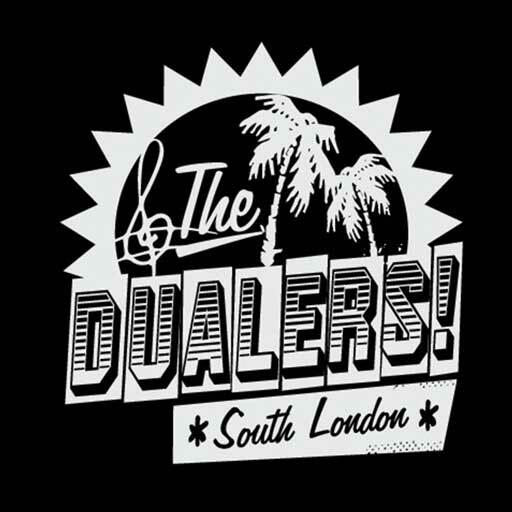 The Dualers are a 9 piece Ska & Reggae band from South East London. The Dualers unique Jamaican style rhythm & blues sound teamed with their lively vibrant performances has seen the band consistently perform to sell-out crowds all over the UK, Europe & Asia. Celebrating the 40th Anniversary of The Jam’s 4th studio album ‘Setting Sons’. 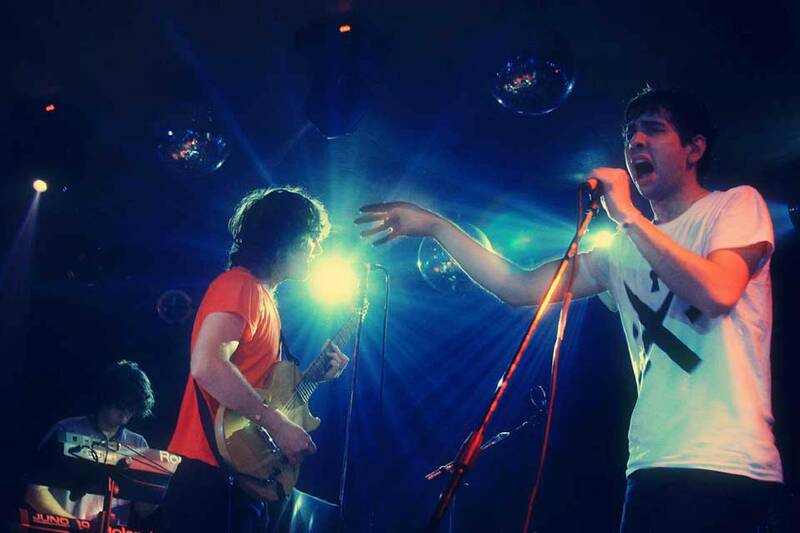 The critically acclaimed album reached #4 in the UK and was the band’s first album to enter the US charts. Succeeding 'All Mod Cons', the album became a commercial success, earning them their first top ten hit single - 'The Eton Rifles'. Our Event Manager can organise all the details. We’ll help you choose the best packages for your needs. In the run up to the event and on the night our Event Manager will be on hand to ensure a seamless, fun event that you and your guests will treasure. 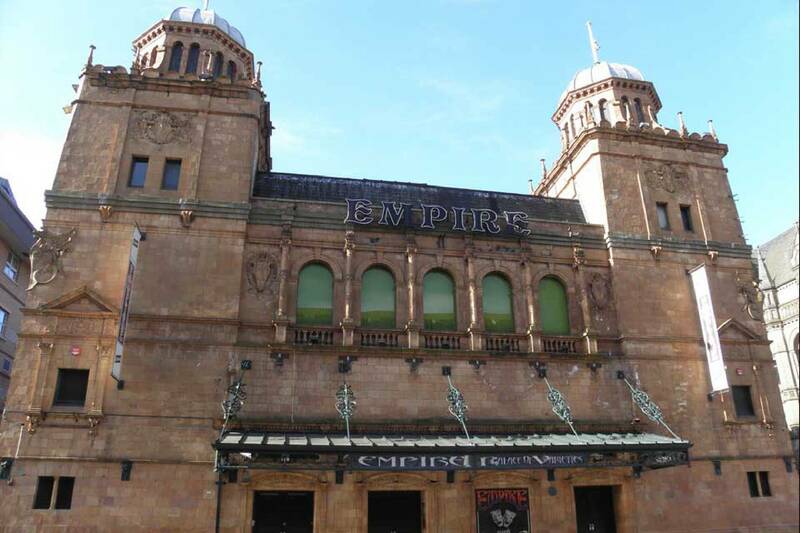 The Empire is located in the town centre right next to the town hall, Train and bus stations are both 2 minutes away. The nearest airport is Tees Valley 15 minutes away. There is a Free (after 5pm) Car park to the rear of the Empire with spaces for 60 cars. By Car, From A19, Take A66 Middlesbrough, Then take third slip road (one after the signpost st.hildas / town centre), 3rd exit from this roundabout, 1st exit from mini roundabout, follow the road round to the right. Thanks for subscribing! We will never disclose personal information to any third parties, except when we are required to do so by law. 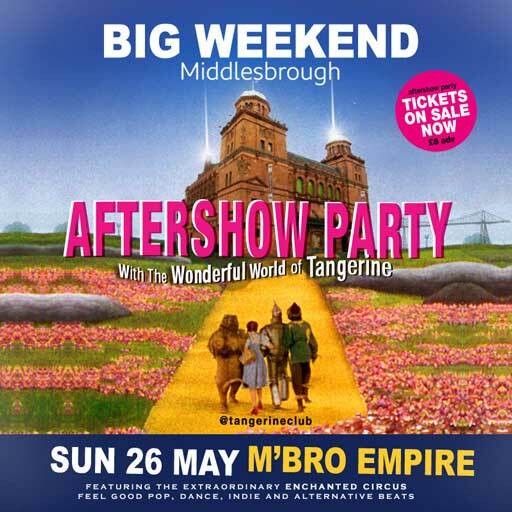 To purchase tickets in person, the Middlesbrough Empire Box Office is open for ticket sales 10.30am till 5pm Mon to Sat inclusive. Public holidays may vary. A minute walk from The Empire, this modern hotel is also 1.1 km from Riverside Stadium sports venue. There is a Free (after 5pm) Car park to the rear of the Empire with spaces for 60 cars. Cannon Park Lorry/Coach Park: 5p0 for 2 hours, £1 for 4 hours, £2 all day. Transporter Bridge Car Park	Free for 2 hours, £1.60 for over 2 hours, £2.20 all day. Middlehaven: There is a suspension of on street car parking charges in northern Middlehaven around Middlesbrough College (Vulcan Street, Commercial Street, Lower East Street and Lower Feversham Street). Take care as there are private car parks in operation in the area. In accordance with section 27 of the licensing law the venue has the right to refuse admission without providing a reason. If you have consumed alcohol prior to arrival & appear to be in an intoxicated state or behave inappropriately in the queue or in view of the venue staff you may be refused entry without a refund. 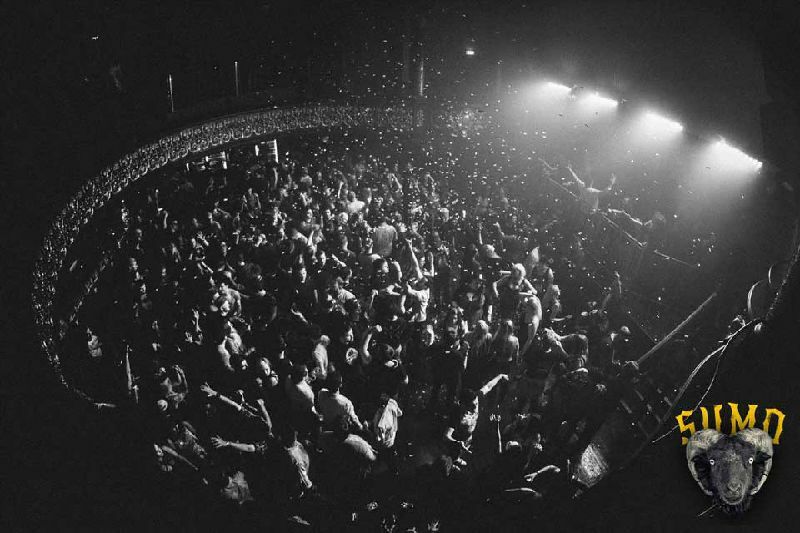 Crowd surfing, smoking within the venue, the throwing of drinks and any other behaviour deemed as inappropriate whilst inside the venue will result in ejection from the premises without a refund. Tickets can not be purchased over the phone directly with the venue. BEWARE OF SECONDARY TICKETING (Touts, eBay, etc). Fraudulent tickets such as cancelled & duplicated tickets can be sold on the secondary ticketing market. 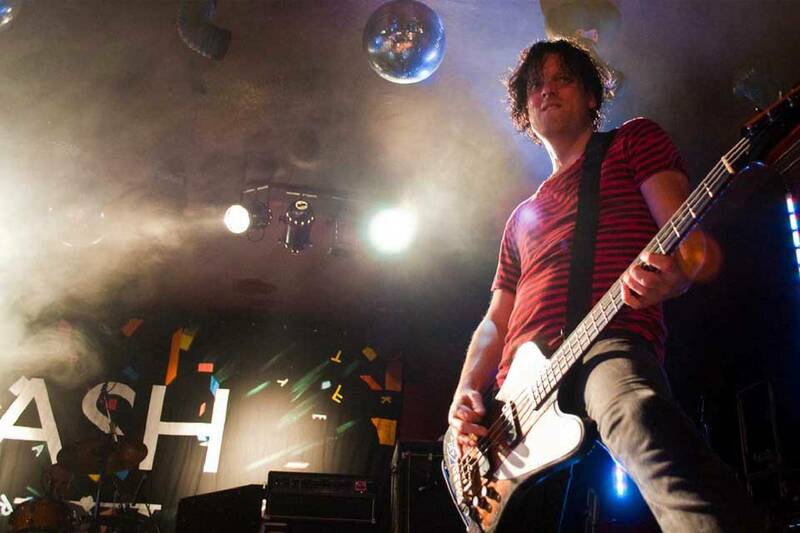 The venue is unable to help with ticketing problems unless tickets are purchased with an authorised ticketing agent. A list of official ticketing agents can be found on the websites, these include, TicketWeb, Ticket Master, SEE Tickets, etc. For the satisfaction of other customers iPads and/or tablet devices are not permitted to photograph or film during any performances. 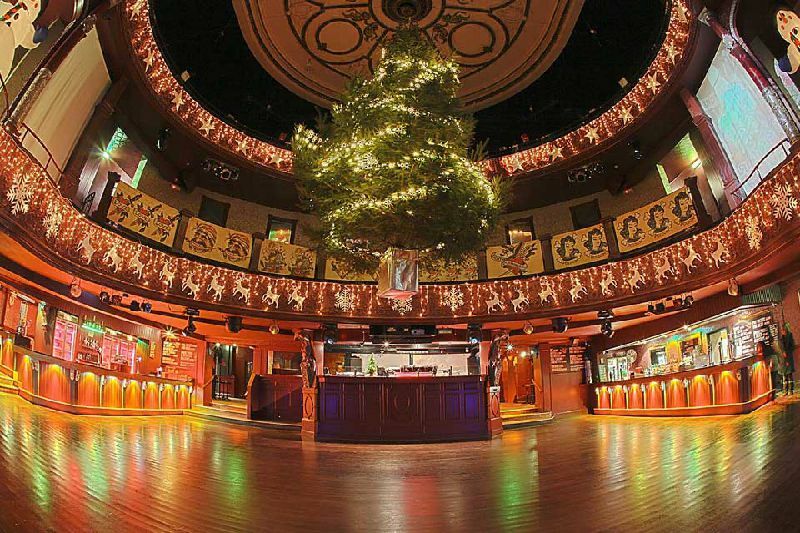 Customers who persist may be asked to leave the venue. No professional cameras (with large or detachable lenses), video cameras or tape recorders are permitted in the venue. Should you be found to have these on arrival you will be asked to either take them back to somewhere safe or be asked to deposit them in the cloakroom. Small compact cameras/mobile phone cameras are allowed unless otherwise specified on the day of the show. If you are lucky enough to look under 25, you will be asked to prove that you are over 18, when you purchase alcohol. Challenge 25 is the same principle as challenge 21. All customers who look under the age of 25 will be required to provide ID when purchasing alcohol. If you are under 18 you are committing a criminal offence if you attempt to buy alcohol and you may be ejected without a refund or held until a responsible adult can come and collect you. People over the age of 18 found purchasing drinks for those not of legal age will be ejected without a refund. Only acceptable forms of proof are accepted. These are listed under the ID policy. The venue cloakroom is situated in the foyer area on the right hand side and charges £1.00 per item. If you are bringing a bag bigger than a ladies handbag and items such as motor bike helmets, backpacks etc with you we request that these are left in the cloakroom. Please be aware that no item will be given out from the cloakroom without the matching ticket being presented. If you have lost your ticket you will be asked to wait till the end of the event, after all other customers have collected, to collect your belongings. 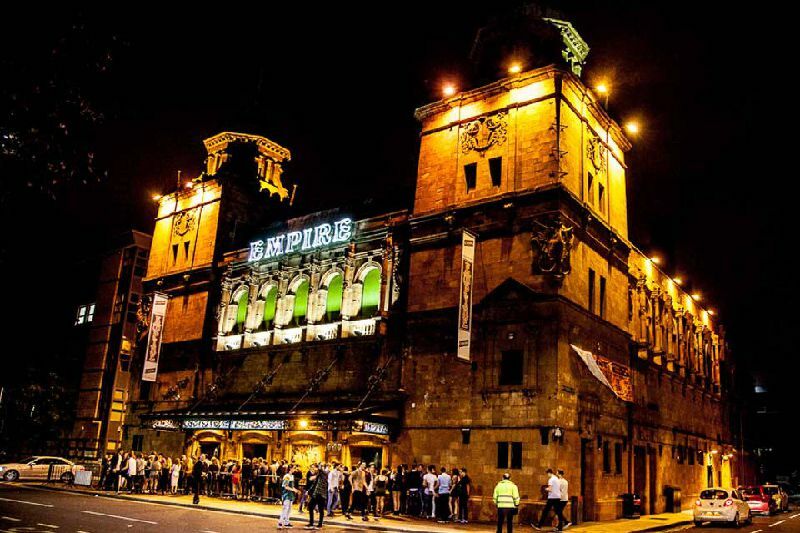 If you have selected the Box Office option when booking tickets they will be available for collection from the box office when doors open on the night of the show. To collect tickets from the box office you will need to have a copy of the order confirmation, ID and the card used as payments for the tickets. The Middlesbrough Empire is keen to promote equality of opportunity for people with disabilities and where possible have taken the necessary steps to meet customers requirements. However the venue is over 100 years old so we are limited in what we can offer. Disabled persons must be in possession of a full ticket for the event. However, if they are registered disabled, they may apply to Peter Hope (email: peter@themiddlesbroughempire.co.uk) for a free carer’s pass for a companion.. There are no restrictions with regards to clothing at most events, however if wearing a hat, hoody or bike helmet you may be asked to remove these prior to entry and that they be deposited in a cloakroom. Some items of fancy dress may be confiscated. No food or beverages should be brought into the Venues; these will be removed on search and confiscated. This includes sweets & chewing gum. The bars at the venue do stock snacks, however we advise you to eat before arriving at the venue. 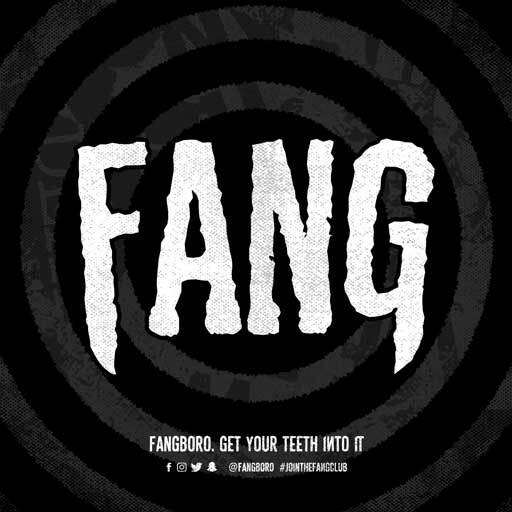 Free drinking water is available on request at bars throughout the venues. Should you require the items for medical reasons please make this known to the security personnel on the front door who will contact the Duty Manager & medical personnel to discuss this in private. Alternatively if possible contact the Venue via email in advance of the show. Anyone who looks to be under the age of 25 years will be challenged to prove their age to buy alcohol. The venue operates Challenge 25. Accepted forms of ID are: Driver's license (full or provisional), or a Passport (valid) or PASS Card with the pass hologram. Any ID found to be fraudulent will be confiscated and passed onto the police. 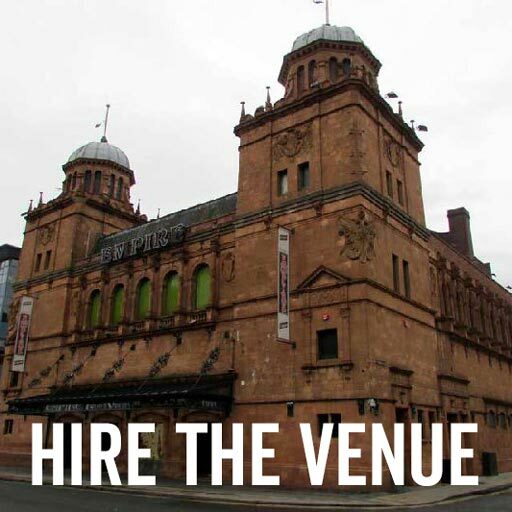 If you have a complaint about the venue or event please speak to a member of security who will try to assist and in turn, if necessary, contact a Duty Manager immediately during the show to try and resolve the issue. Complaints after an event should be sent in writing (via email) directly to the Venue’s enquiry address listed on the website. 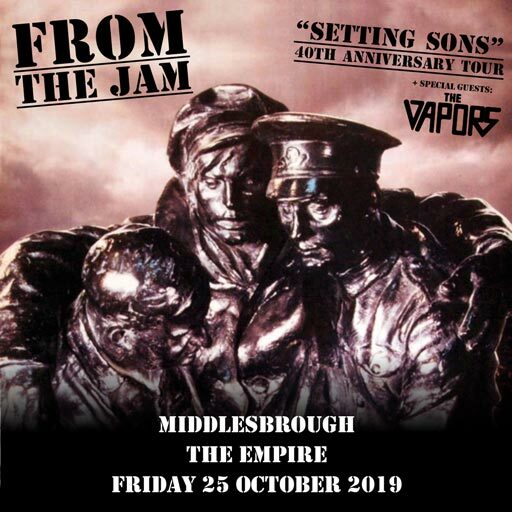 If you have lost items or left them in the cloakroom please call or email the venue directly on Tel 01642253553 enquires2@themiddlesbroughempire.co.uk with a description of the missing item, date of the show contact details and any other relevant information. The venue will check and if the item can be located will be in contact to arrange for you to collect the item. 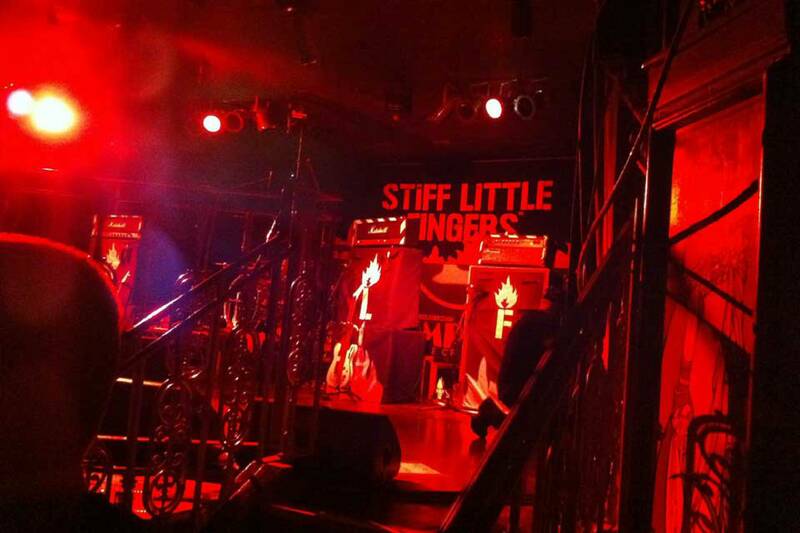 The venues keep items for a maximum of 2 weeks after this period they are passed to local charity shops. Valuable items may be held for a longer period. Items such as passports etc are kept for 28 days then destroyed. Confiscated ID's are handed to the police. Please be aware that there will be high sound levels during shows and patrons may be subject to continuous sound levels which may cause potential damage to hearing. Ear plugs are available on request should they be required. 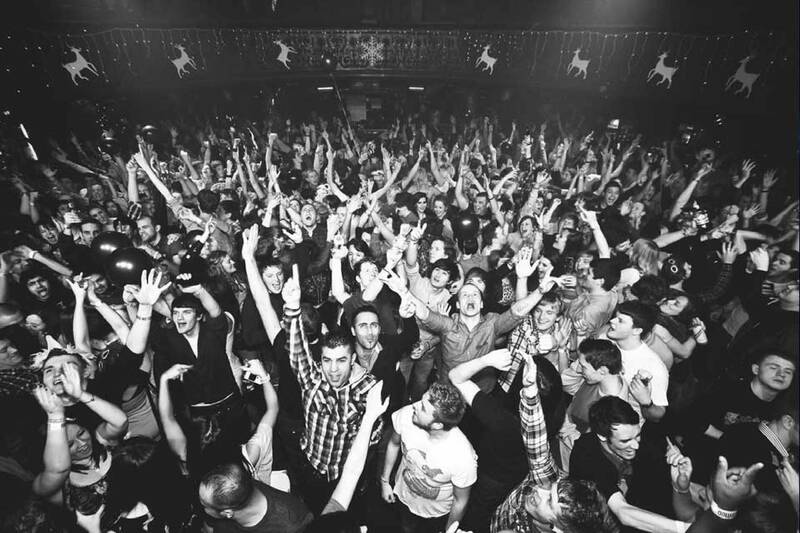 Once you have entered a venue there will be no pass outs and no re-admittance. Should you leave the venue for any reason you will not be readmitted and no refund will be given. Unless its for emergency or within the smoking area. A sealed package of prescribed medication of a small quantity is permitted providing that the persons name is on the label. A prescription for the medication if possible should be brought with you if possible. Any person with items that are deemed unidentifiable / not in the original packaging or of a large quantity will be asked to speak with the Medics on the night who will assess the situation and the items may be removed until after the show and held in the medical room where they can be accessed if required. Please be aware that evidence may be requested by security or the medic on entry. You may also be requested to speak with the Duty Manager. A person who intends to bring into a venue medical sharps will be asked to discuss their usage with the Senior Duty Manager & the venues medical staff, in a private area, to ensure that their condition requires immediate access to these items and to also ensure the customer is aware of how to locate and access an area whereby they can administer the required treatment without any concern. For the majority of shows the doors open at 7pm with a curfew of 11pm. 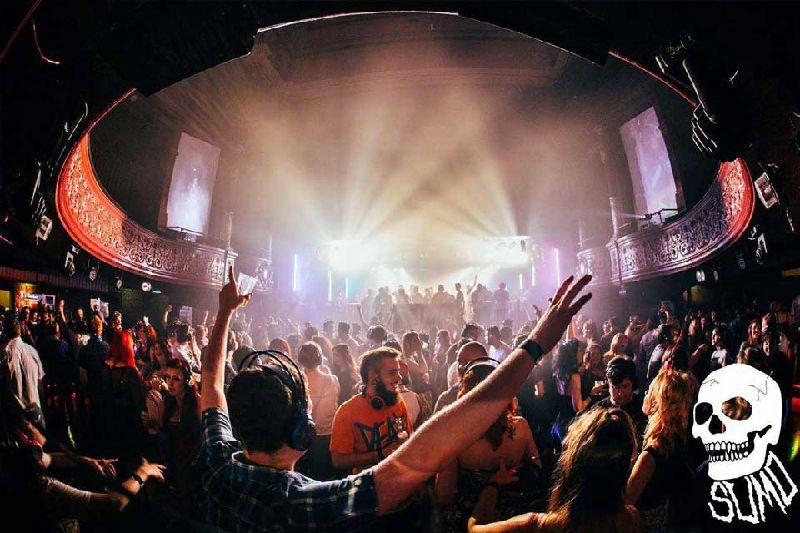 On nights when there are club events after a gig (Fridays & Saturdays) doors will open at approximately 7pm with a 10.30pm curfew. Door opening times will be printed on the tickets. 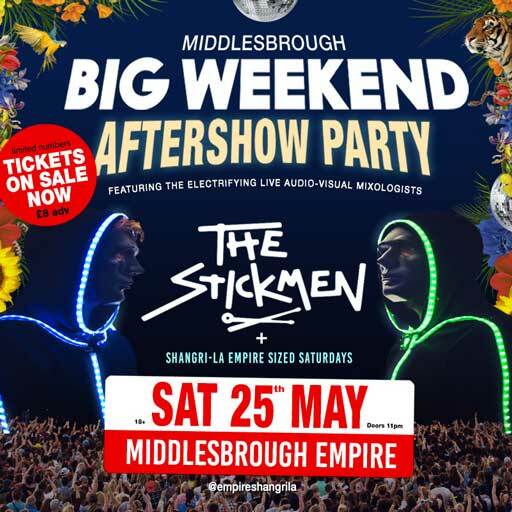 Late night events start and finish times differ and details will be on the tickets and the event information page found on the venue’s website. Show times & support acts will be listed on the venue’s website & social networking pages as and when they are known to the venue. Normally this is not known until the day of the show. All times and support acts listed are subject to change and are to be used as guidance only. Do not use the stage times listed to make travel arrangements. In line with the law, The Middlesbough Empire is a non smoking venue. Please be aware if you appear to be under 18 you may be asked for ID to enter the smoking area. 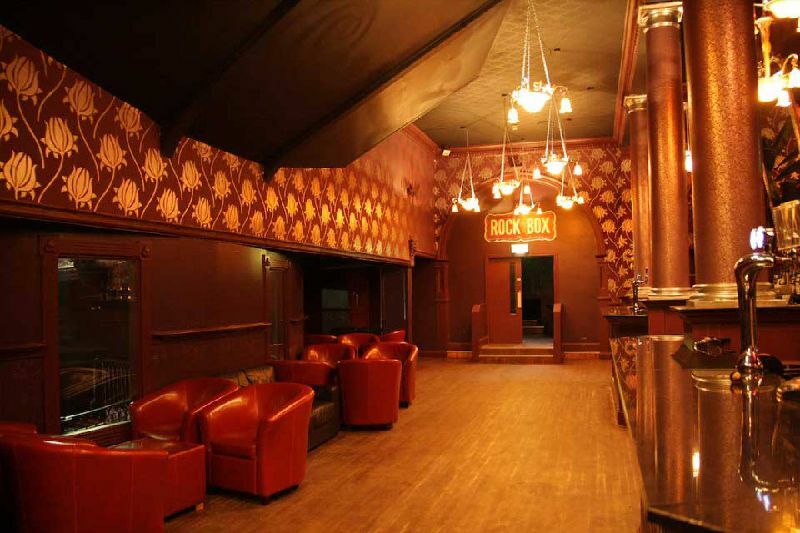 Those found to be smoking inside the venue may be ejected without a refund. 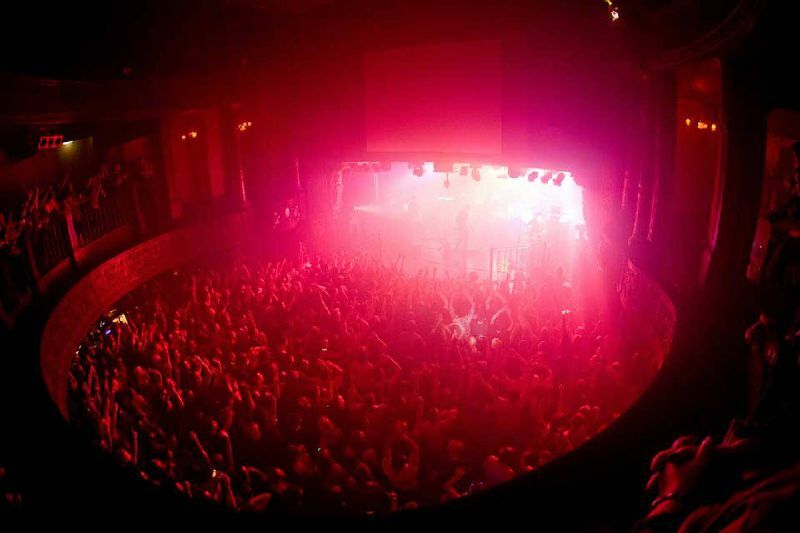 Some shows will contain strobe lighting or smoke effects. Signage will be up in the venue to advise of this. Should you have an issue please speak to a member of staff on the night. Terms and conditions can be found on the reverse of all tickets and on the bottom of home printed tickets. Crowd surfing and the throwing of drinks are strictly prohibited in the venue and those who do this will be ejected without a refund. censing law the venue has the right to refuse admission to any patron without providing a reason. For live gigs - Companion / Carer Ticket. 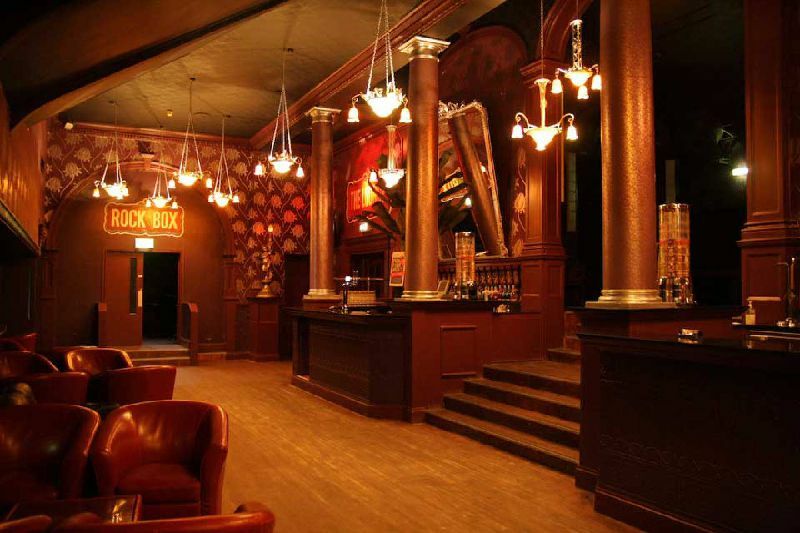 This venue offers one free companion ticket, which can be booked by contacting the venue directly. These can be limited in availability so please ensure you contact the venue as soon as possible to arrange companion / carer ticket Holders should be able to meet the needs and assist the person they are accompanying in the event of an emergency. We recommend arriving at the venue 10 - 15 minutes prior to the doors opening. The door time will be stated on the tickets or confirmations. Please try to arrive at the venue no later than 60 minutes after the doors open. On arrival please go to the front door and give your name to security / present your email confirmation. Security will guide you through the process of getting your carer pass (if applicable) and getting to the required viewing area. There is one accessible toilet in the ladies and one in the mensin the venue. 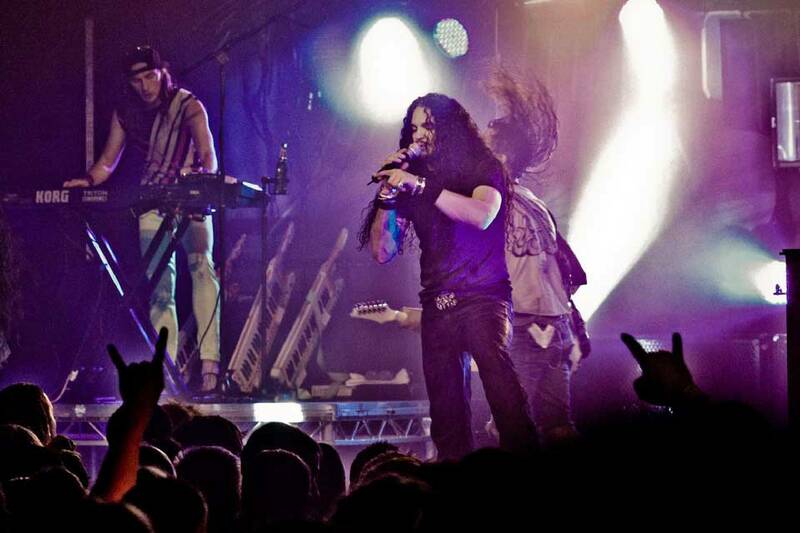 Events may use strobes, stroboscopic lighting, smoke effects & pyrotechnics. On such shows signs are displayed. On shows with a higher than usual amount / level of this effect extra signage is displayed.